UK brand Cherry Picker launches new jacket and gilet with integrated hydration pouch for easy drinking on the go. Riding the back lanes and bridlepaths in the UK usually involves mud – or if you’re lucky dust – caking your bike and your water bottles. Our mountain biking friends over at MBR have long got around this by widespread adoption of hydration backpacks, but this is not ideal as the weight, sweat build-up and straps soon become uncomfortable and your centre of gravity is lifted, potentially affecting your stability. >>> Is milk a good rehydration option? First breaking cover at the London Bike Show this year, UK brand Cherry Picker has come up with a “hydration jacket” featuring an in-built reservoir, which allows you to carry water within your clothing and lower down your back. 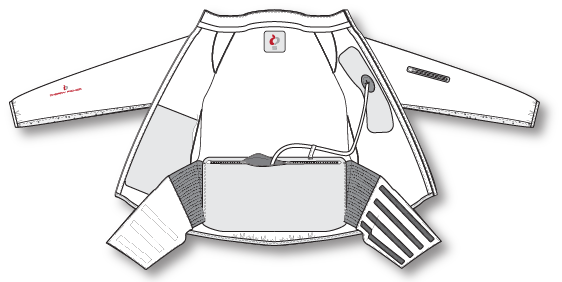 The 2 litre reservoir is built into back of the jacket’s waistband and secured by a wide Velcro strap at the front to ensure that it does not move around. The hydration tube from the reservoir passes through the jacket to emerge through a breast pocket, allowing easy access whilst moving. The jacket itself, which has been partly designed by Olympic silver medallist Rob Hayles, has a cycling-specific cut with a range of pockets, including the cyclist’s favourite three at the rear. It’s made from water resistant stretch material with welded seams and reflective elements. A sleeveless gilet version is also available, and the RRP currently sits at £74.99. For further information visit Cherry Picker’s website.